Berkeley, California, a small city with a big reputation, is famous for its branch of the University of California, with its high academic achievement, as well as its liberal politics, free speech movement and its sophisticated performing and visual arts. The new 82,000 square foot home of the UC Berkeley Art Museum and Pacific Film Archive (BAMPFA) catapults Berkeley’s visual art scene into greater prominence — comparable to many larger, richer and better established West Coast museums. BAMPFA’s newly built structure is an absolute winner. Located in the heart of downtown Berkeley’s arts district, it handsomely repurposes the former 1930s WPA UC printing plant building. Affixed to it is the brightly-clad steel tube-like section that houses the new 232-seat Barbro Osher Theater where films from the impressive archive will be regularly screened. There is also a 33-seat screening room and two film viewing booths available by appointment. As a building that needs to serve town and gown, visual art lovers and movie goers, the new BAMPFA very successfully performs its multiple functions. And although its steel covering, reminiscent of a Frank Gehry project, is incongruous with the neighboring buildings, it still seems to work. The design by the world-class architecture firm, Diller Scofidio + Renfro, has created an inviting open, multilevel environment, with its share of hidden corners, and reading, art, performance and meeting places. And, of course, a café and gift shop. On the “Art Wall” of the multilevel performance space is an enormous ink mural, “The World Garden,” created in five days by Chinese artist Qiu Zhijie. It’s an ingenious and inventive work that demands a second (and third) look. Twice each year artists will be selected to produce new art for the wall. Large windows allow passers-by to see what’s going on inside the museum. There is a large outdoor screen with changing art displays on which films will be shown. One can surmise that the new building was, in part, designed in contrast to BAMPFA’s former 1970 Brutalist concrete structure by Mario Ciampi, now closed because of seismic safety concerns. The exhibition’s concept is to aid in the understanding and appreciation of the value, function and effects of architecture through various media and time periods. Many of the pieces are from BAMPFA’s collection while others are on loan for this exhibition. It’s a creatively curated show and most of the individual works are engaging, edifying and well-presented. The Museum’s large white walls, high ceilings, ample natural and artificial light and generously-sized galleries make the exhibition easy to view. Some of the works have a more obvious relationship to architecture than others, but that didn’t adversely affect my pleasure in wandering through the galleries. Chris Johanson’s 2003 colorful acrylic on wood, “Cityscape with House and Gray Energy” is about the tension between urban environments and chaos. Two small houses, on separate pieces of wood, but attached to the main cityscape, represent the artist’s childhood home and “unknown weight coming into the mind.” Similarly, Georgia O’Keeffe’s attractive 1953 oil on canvas, “Wall with a Green Door” is wholly architectural. Its straight horizontal lines of sky and building are contrasted with the almost square green door that floats in the center of the front wall. Stephen Kaltenbach’s’ monumental “Portrait of my Father” (1972-1979) deals with the architecture of the mind, rather than with physical construction. The artist’s father is revealed in the late stages of Alzheimer’s disease, which is expressed with nerve synapses spinning out of his head, accompanied by Chuck Close-like hyper-detail and filigree. It is a difficult, moving, extraordinary artistic vision. 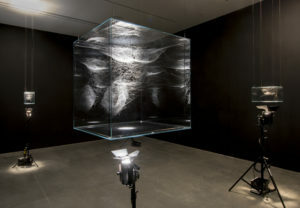 Off in a separate, small room are small spider web sculptures by Argentine artist Tomás Saraceno, which actual spiders created. They are fascinating in their detail, complexity and artistic merit. The late Ruth Asawa’s woven open wire sculpture make an intriguing contrast with Saraceno’s spider webs, since Asawa’s much larger biomorphic works are regular and symmetrical and actually seem more organic than the spiders’ webs themselves. Many internationally known 20th century and contemporary artists are represented in “Architecture of Life,” including George Ault, Louise Bourgeois, Fernand Léger, Marcel Duchamp and filmmaker Ben Rivers, whereas some of works are remarkable physical objects that are thousands of years old. Think of the exhibit as an eloquent survey course on art and architecture. And, by all means, don’t wait too long for a visit.